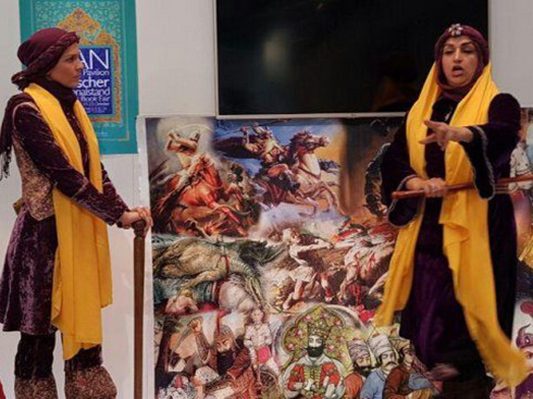 During the recent Frankfurt Book Fair, the Iranian story-telling tradition known as ‘Naghali’ was presented to the visitors by Iranian female Naghals. The Institute of Contemporary Art Development and the Iranian Embassy’s cultural attaché in Germany, jointly organized a music and narration performance ‘Epic Twins: Rostam and Siegfried’ at the Iran pavilion in the 68th Frankfurt Book Fair. The text research and performance was from Sara Abbaspour and Parisa Simin-Mehr who had two shows in both Persian and German every day at the event. According to a report by Financial Tribune, the performance was also accompanied by classical Persian music. Nazli Bakhshayesh, Alan Foroughi and Parsa Ahmadzadeh played the harp, ney and tonbak. Iranian story-telling tradition known as ‘Naghali’ is the narrating of important stories from Iranian fables, myths and epics mentioned in the most important books since ancient times. It is usually undertaken before a big cloth or canvas hung on the walls of tea or coffee houses, painted on which are the events of the story being told by the naghal. Stories are mostly taken from the tales mentioned in the globally-acclaimed poet Ferdowsi’s epic book Shahnameh (Book of Kings) and the naghal plays the roles of different characters with special tone, feelings and expressions. Rostam is the most celebrated legendary hero in Shahnameh and Iranian mythology. He is always represented as the mightiest of Iranian warriors and is best known for his mournful fight with his son, Sohrab, who was killed in the battle, and for his seven quests where he fought with a lion, a dragon and a demon among other creatures. Siegfried, also called Sigurd, is a figure from the heroic literature of the ancient Germanic people. He appears in both German and Old Norse literature. A feature common to all versions is his outstanding strength and courage as like one story where he fights with a dragon. Simin-Mehr has been working on the Shahnameh and professional storytelling (naqali) since 2000. She has narrated several stories from Ferdowsi’s Shahnameh, Saadi’s Bustan, Nezami’s Khosrow and Shirin and other Persian classics across Iran and in Italy and Germany. Abbaspour has also performed at several naghali sessions in Iran, Italy and France. The Iran pavilion at the prestigious German annual event also hosted a variety of programs including the launching of books and sessions on different aspects of Persian literature. A total of 41 Iranian publishers presented new titles in adults and children categories, Mehr News Agency reported. Tehran Publishers and Booksellers Association, Islamic Revolution Publishers Forum, Sacred Defence Publishers Society, Women Publishers Cultural Society and the Iranian Association of Academic Publishers were among the participants. Children’s author Farhad Hassanzadeh, novel writer Davoud Ghaffarzadegan, screenwriter, critic and journalist Naghmeh Samini and writer Saeed Ramezani were among the literary figures who held meetings at the Iran pavilion.